Great Books make Great Teachers! One of the unique strengths of Connecting with History is its use of "real" books. 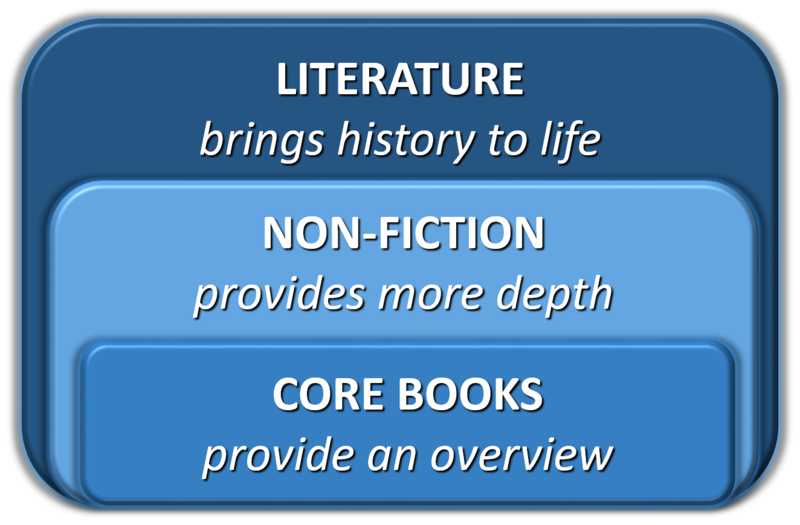 Core Books are necessary for each age level. These are assigned throughout the school year and form the core of your child's history studies for the year. Literature and Historical Fiction is recommended. Historical fiction inserts the child into the time period - they live history! Each Syllabus and Daily Lesson Plan contains reading lists for all age levels. Depending on your goals and situation, you may choose as many or as few books from the lists as you like. Because Connecting with History is designed with multi-age teaching in mind, we use the classical levels of education to emphasize the developmental stages of learning. This system also helps simplify your life by grouping children of similar ages so that they can work together, share resources and streamline the teaching process. The grade levels here are flexible guidelines to help you decide where to place your child. Approximately grades K-3: Emphasis on read-alouds, picture books, easy readers and hands-on activities. High teacher involvement. Third graders who are strong independent readers may be placed in the Grammar level. If you have children in both Beginner and Grammar levels and want to combine them we generally suggest you place them in the Grammar level. Approximately grades 4-6: Chapter books, historical fiction, biographies, simple reference books, some formal literature study (optional), creative writing assignments, book reports, hands-on activities, and participation in family read-loud time. Teacher involvement is active, but most of the student's reading can be done independently. Approximately grades 7-9: More emphasis on non-fiction and retellings of classic literature. Some historical fiction at a more mature, but age-appropriate, level. Creative writing, essays and reports involving research. Optional literature analysis. We continue to recommend participation in family read-aloud time. Teacher guidance needed but student takes more responsibility for selection of activities and completion of assignments. The teacher should be regularly available for one-on-one discussion. We strongly encourage a Socratic style of open-ended discussion between teacher and student. Approximately grades 10-12: More demanding reading assignments; primary sources, both fiction and non-fiction; literary analysis; reports and essays that require independent research and critical-thinking. Students at this level should be self-motivated with teacher guidance as necessary. The teacher should be regularly available for one-on-one discussion. We strongly encourage a Socratic style of open-ended discussion between teacher and student. For your convenience, RC History carries all of the books recommended in the program.